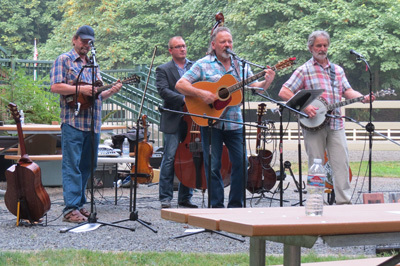 Close to 100 people attended our annual bluegrass event with the Cascade Mountain Boys bluegrass band. Some brought picnic dinners, but many purchased excellent BBQ sandwiches from HP’s Smokehouse BBQ. The weather was fine and the music was great – great dobro, mandolin, banjo, finger picking guitar, and vocals. The band played for nearly two hours. A nice evening in the park for all.